MANILA–BAYAN USA was present and supports the recent 3-day hunger strike led by Anakpawis partylist representatives Rafael Mariano, Crispin Beltran, as well as several prominent peasant leaders held outside the House of Representatives during a special session held by Congress in Manila. The urgent action, spearheaded by Anakpawis, Kilusang Magbubukid ng Pilipinas (KMP), Pamalakaya, and the peasant women group Amihan, was held in condemnation of state-directed killings of leaders and members of progressive parties and legitimate peopleâ€™s organizations pressuring for social change. The group fast commenced early Wednesday, March 30 and lasted until the evening of Friday, April 1 outside the gates of the Batasan complex, site of congressional buildings during a Congressional special session over the controversial Value Added Tax (VAT) hike bill. “We are here parked outside the Batasan gates to draw the attention of the leadership of the House of Representatives to act immediately on the series of political assasinations of leaders identified with militant partylist groups such as Bayan Muna, Anakpawis, and left-leaning organizations like KMP, Pamalakaya, Bayan, and Gabriela,” stated in a statement released by KMP. Since the start of the year, 32 members and leaders of progressive parties and peopleâ€™s groups have fallen victim to extra-judicial killings and another 5 victims to involuntary disappearances. In light of the state terror campaign against these leaders to suppress a growing mass movement fighting a legitimate struggle against social ails, what is intolerable is the telling silence from the Macapagal-Arroyo administration. The hunger strike was joined by a contingent traveling from Hacienda Luisita by the end of the program. 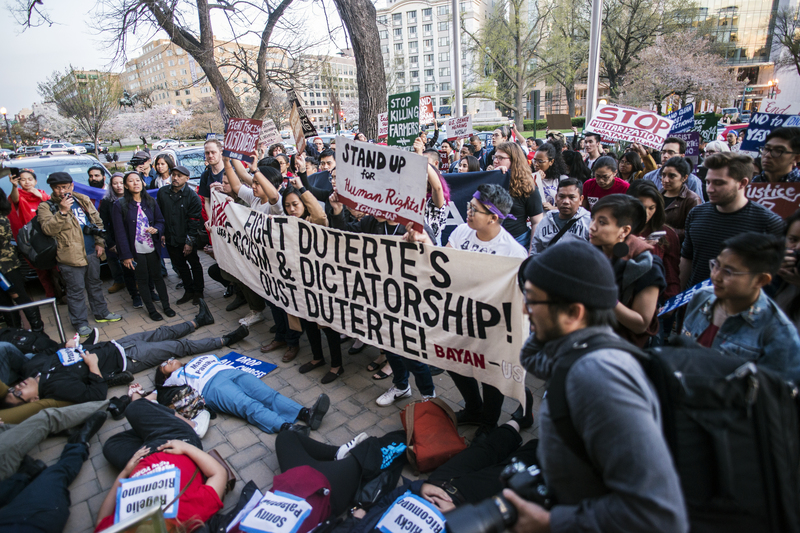 BAYAN USA will also sponsor the official delegation to the International Solidary Mission in the Philippines, scheduled for August 12, 2005, as an internationally-coordinated fact-finding mission drawing attention to the rampant killings and other human rights atrocities ensuing in various regions of the Philippines under the US puppet Arroyo regime.